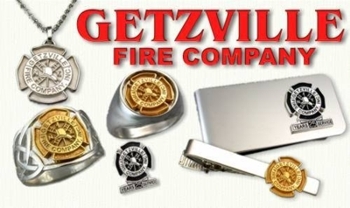 Here is a product line we created for the Getzville Fire Company. 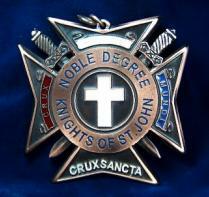 deSignet will gladly create a special deSign for your church or organization. 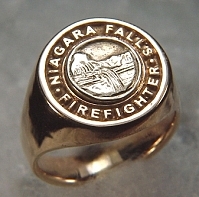 Our deSign Team has over 100 years of experience in the jewelry industry. 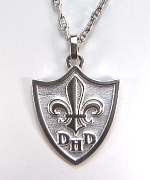 Let deSignet be your online source for a wide range of Specialty Jewelry. Fill out our Sketch Request Form and get the ball rolling. . . Need More ideas? 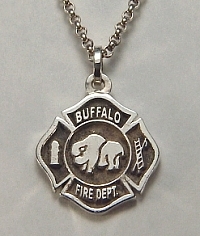 Then vist the Public Safety page for more Fire Fighter, and Police Jewelry. 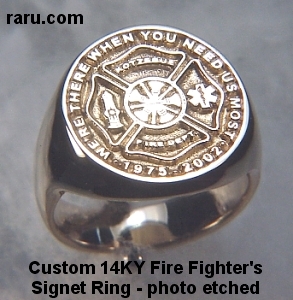 Or email or call us at 1-888-RARU-COM (888-727-8266) for gold pricing and with your ideas. 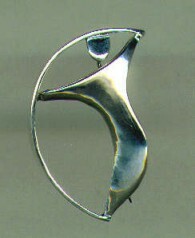 Available in 14KT, 18KT and platinum. 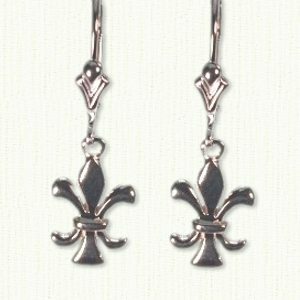 white gold with three initials and Fleur-de-lis. 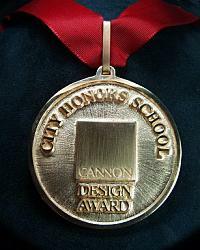 Custom graphic and mold fee applies. Here is a Wonderful Idea! 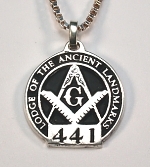 A memento you will enjoy wearing and what a great conversation piece. Everyone will ask if it has some special significance and then you get to tell where and when. This coin, brought back from a vacation to Greece, has become a prized piece of someone's wardrobe, not to mention the joy that comes from the memories attached. The concept is so simple. 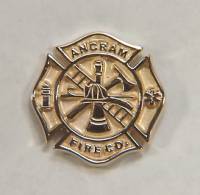 Send us a coin, any size will do and we will attach the loop and bail and coat the coin with 18KT yellow gold electoplating, all for $39.00 plus shipping and handling. 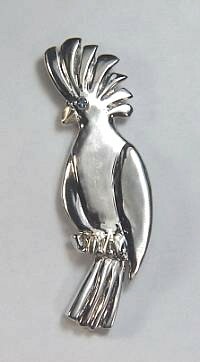 How about cuff links? 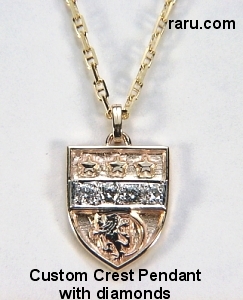 Many coins make perfect cuff link and can be gold plated as we did with these Australian Coins. 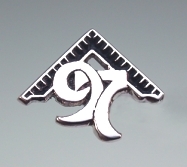 Visit our Custom Cuff Links Site for pricing and more ideas. Call for pricing in your size. Customer Response : "I just received my ring (Fire Fighter's Emblem Ring). IT IS ABSOLUTELY GORGEOUS! The detail is extraordinary and so very well made! 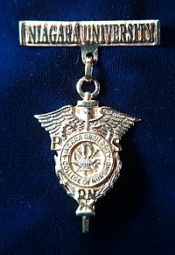 I received it at my office and one of my friends' father was a jeweler. 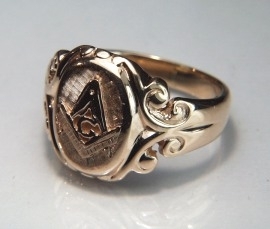 She said it was a beautiful piece of jewelry and was interested in your web address. Everyone my husband comes into contact with will know of you. Thank you so much for the fast and quality service!!!! I can't tell you how pleased I am!! 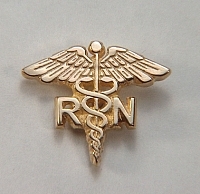 Custom 14kt yellow gold tack. Custom graphic & mold fee apply. 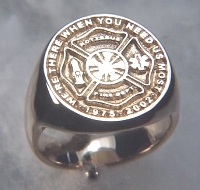 Custom, photo etched signet ring in 14kt yellow gold. 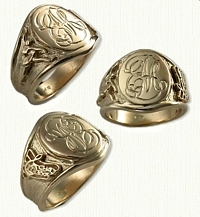 Pricing based on size and finished gold weight. 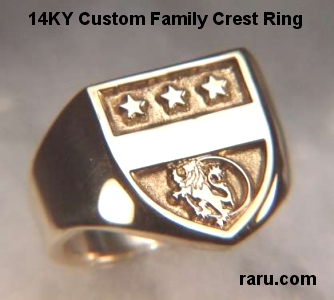 Custom 14kt two tone gold, 16 dwt . 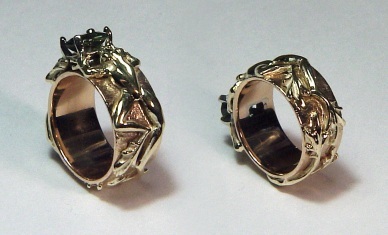 Pricing based on size and finished gold weight. Call for pricing. Custom graphic & mold fee apply. 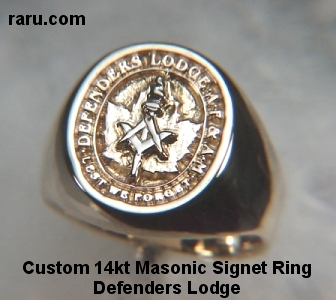 Visit our Custom Signet Rings Site for other ideas. 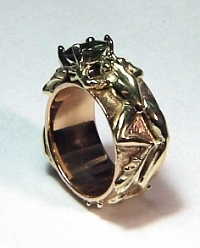 Custom 14kt yellow gold, 15 dwt with a .33ct round brilliant cut diamond. 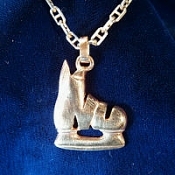 Pricing based on size and finished gold weight. Call for pricing. Custom graphic & mold fee apply. 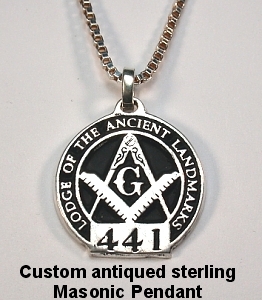 Antiqued sterling silver logo pendant (3/4" size). 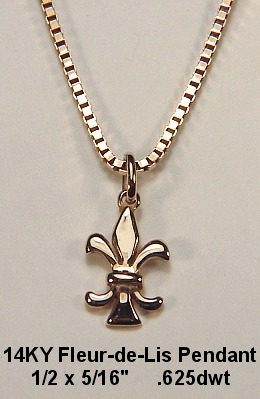 Available in sterling silver, gold or platinum. Call for pricing on your logo. Chains sold separately. 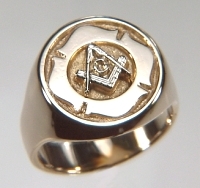 This is our antique Masonic Signet ring which is available in 14kt yellow or white gold, 18kt yellow or white, and platinum. 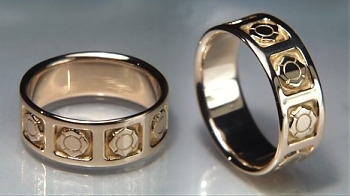 Gold and platinum pricing varies depending upon finger size. Please call for a quote. 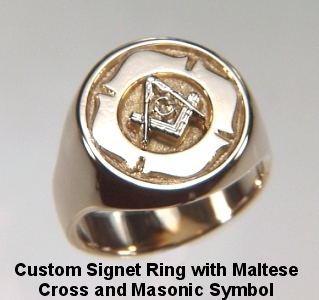 We can set most any Masonic symbol on the oval face. 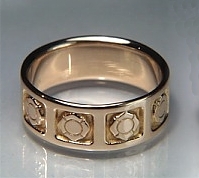 This ring as shown (14kt yellow gold, size 10) runs $330.00 + shipping. 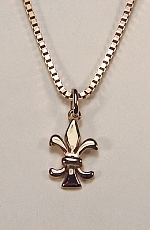 Please note: we Do Not carry any other styles but will gladly create a Custom piece for you. 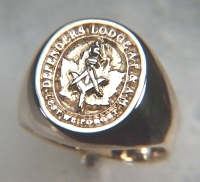 Visit our Signet Rings Site for other signet styles. 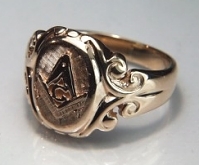 14kt white gold Masonic emblem. 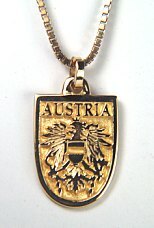 Pricing based on size and finished gold weight. 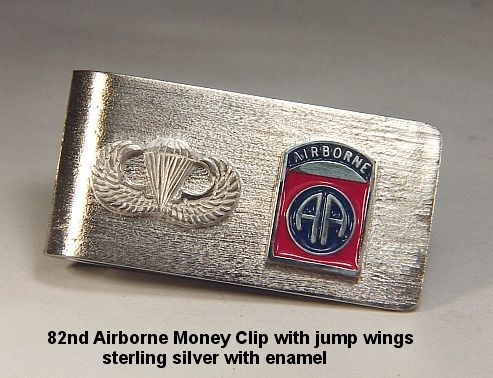 We Sterling silver textured money clip with sterling jump wings and an enameled 82nd Airborne emblem. Do you have a favorite instrument or musical symbol? 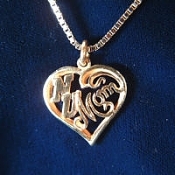 We can recreate it in sterling silver or 14kt gold just for your or that special someone. These sterling trombone cuff links are just one idea. We also carry a "G" clef, a cross intertwined with a "G" clef, clarinets, saxophones, trumpets, French horns, flutes, violins and a variety of eight notes. Call us and we will work with you or your organization to create something truly unique. 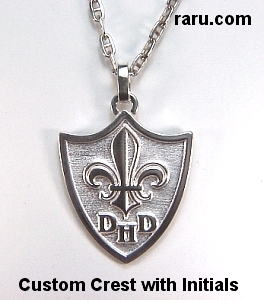 Visit our Custom Religious Jewelry Page for other ideas. What a unique way to show off your love of the all time favorite American Food...Pizza! 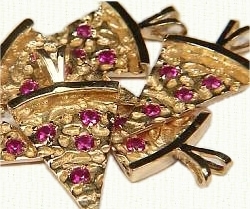 The entire Pizza line is available in sterling Silver or 14kt gold with real rubies. 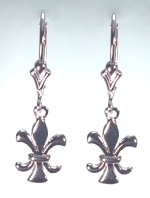 In 1989 Roman Jurga came to the United States and began working in the jewelry trade which he had learned in Poland. He came to work at deSignet in 1990 and has become an integral part of our staff. 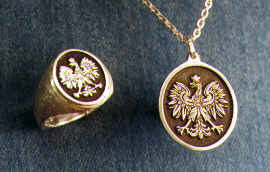 With his talents and input we have developed an entire line of Polish Eagle Jewelry . 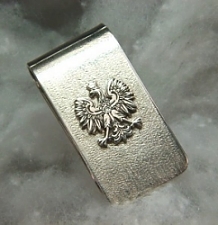 Textured Sterling Silver money clip with pierced eagle. 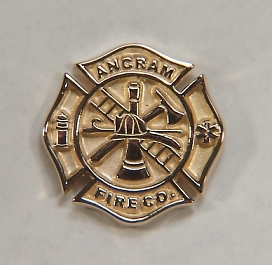 Visit our Custom Money Clips Site other ideas. Custom items, shipping and rush fees are non-returnable. 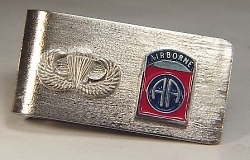 Stock items may be returned within 30 days and a restocking fee applies. Please see our FAQ's page for more details. 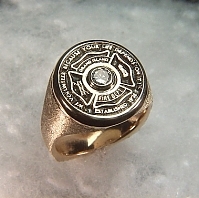 Shipping daily using UPS which is insured and requires a signature.